Travel with Kevin and Ruth! 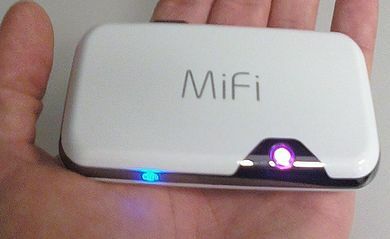 : Bought a Mi-Fi! We can do without television, but we can't do without internet. So when we're not near a source of wi-fi, now we can just fire up our Mi-Fi! The Mi-Fi is a wireless device that hooks into the cellular network and the internet. Then, it distributes a wi-fi signal that up to five devices can connect to at the same time. So wherever there is a cell signal, we can get on the internet. We bought it outright because they had a special where they only just discounted the price from $249 down to $99. So we don't have a contract, and can start or stop the service on 30 days notice. And, we can use it in the USA without roaming charges! We have what is called the "Mobile Internet Flex North America" plan, which gives us 500MB of use for $45. The plan then steps up in price depending on how much you use it. The funny thing is that this plan is unadvertised. I think Bell really doesn't want you to know about it because the carriers make so much money from ripping people off with roaming charges. When using it in Canada only, we revert back to a normal plan which give 3GB for $55 a month. We can switch back and forth at any time on 30 days notice. Also, Ruth received the 2011 MS Streets and Trips GPS kit that we won in the contest that Sam and Donna had. Looking forward to trying it out when I get back to Nova Scotia! Can you tell me how many hours that plan will give you on the internet? I am very interested in this plan. I read those Mi-Fi's are a good deal. Great find on the "plan". Will have to check it out when we get on the road! We have no experience with changing from Canada/US so I can't comment on that. We have used a very similar device for three years an absolutely love it! We have found few places it doesn't work. Enjoy! I'm getting one of those! great tips ...because we all need that internet fix...oh, yes, we do....we're hooked! We just ordered a MiFi and it should arrive in the next few days but we were told there is no North America plan. We want it for our trip through the States, and were told for us to use it at home in Canada would be very expensive. You bought it through Bell? Mi-FI details & more details please!! Glad to see you finally got the North American plan Kevin. Ours works great, had it since Christmas.We have a message that comes up while connecting in the USA. It says that we are roaming and extra charges may apply. We were told to press OK and ignore it. And yes they do try hard to hide it from the consumer. Pidge...this is a plan designed for Canadians, so I don't think it would be best for you. You can get one from Verizon in the U.S. though...also, internet usage isn't billed by the hour, it's by the amount of bandwidth that you use. Brooke...yes, I bought it at Bell Mobility in Canada. You have to go to a corporate store to get this plan, it's not available online. Contessa...the only more details I can think to give you are the step up rates. It's $45 for the basic 500MB or less. Then it goes up to $60 if you use between 500B and 1GB, then $90 for up to 3GB. Yes, this is starting to get expensive, but it's FAR cheaper than the normal roaming charges. Plus, the idea is to use this device only in situations where there is no other option. Remember, this plan is unadvertised, and most salespeople in the store don't know about it. Mike...thanks for telling me about it in the first place!